The fast food workers’ strike in the US. They were not paid to strike. But will these strikes actually work? Russians respond to the ban on western food. The rich are eating better, the poor are eating worse. Sugar and fat are not addictive. In Boston, food trucks are safer than restaurants. Why fast food is more expensive this year. Organic farming won’t save the world. Raw sugar is no healthier than refined sugar. Alain Ducasse (almost) abandons meat. Rumours of shortages of kale, chia seeds, amaranth, and quinoa. A brief history of the pumpkin spice latte. Americans are eating more butter. In praise of Yotam Ottolenghi and Diana Henry. A history of picnics through photography. A market in Da Lat, Vietnam. How to divide cake batter evenly between pans. Where to eat in Gujarat. The science of chocolate chip cookies. How to clean a wooden rolling pin. Things that contain no calories. Raspberry and quince jelly teacake. Death threats at a whiskey distillery in Texas. Chicken, bacon, and bean stew. A few weeks ago, my friend Nafisa sent me a photograph of a banner outside a cafe in Linden in Johannesburg’s northern suburbs. 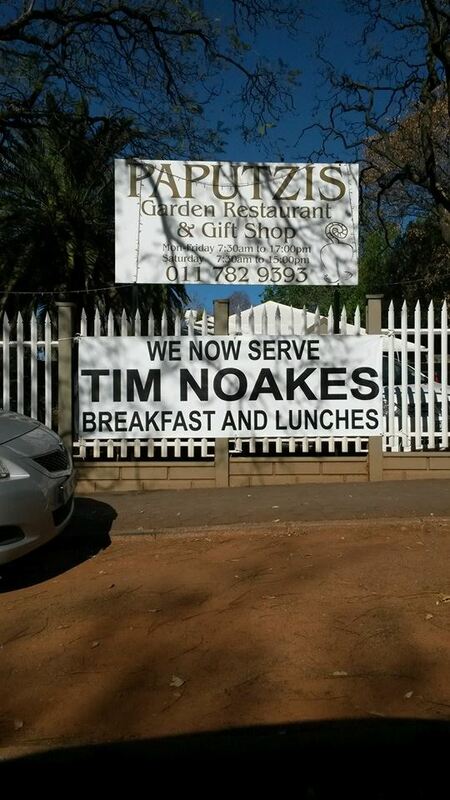 In a particularly good demonstration of why punctuation helps to avoid horrific confusion, it advertises that it ‘now serves TIM NOAKES’—with ‘breakfasts and lunches’ in smaller script below. In Linden, Johannesburg. Courtesy of Nafisa Essop Sheik. After many vain attempts to find a doctor with a cure for corpulence, and after futile experiments with Turkish baths and the like, it is ironically diminished sight and hearing that incidentally lead Banting to his miracle. His ear surgeon suspects a constriction of the ear canals, Banting reports, and advises him to abstain from what Banting terms ‘human beans’—‘bread, butter, milk, sugar, beer, and potatoes’—so called because they are as harmful to older persons as are beans to horses. The diet was so efficacious that Banting lost forty-six pounds in a year, and reported feeling healthier than ever before. So what did he eat? For breakfast, I take four or five ounces of beef, mutton, kidneys, broiled fish, bacon, or cold meat of any kind except pork; a large cup of tea (without milk or sugar), a little biscuit, or one ounce of dry toast. For dinner, five or six ounces of any fish except salmon, any meat except pork, any vegetable except potato, once ounce of dry toast, fruit out of a pudding, any kind of poultry or game, and two or three glasses of good claret, sherry, or Madeira—champagne, port and beer forbidden. For tea, two or three ounces of fruit, a rusk or two, and a cup of tea without milk or sugar. For supper, three or four ounces of meat or fish, similar to dinner, with a glass or two of claret. For nightcap, if required, a tumbler of grog—(gin, whisky, or brandy, without sugar)—or a glass or two of claret or sherry. Noakes-ites will note that Banting included some carbohydrates in his diet, and seemed to shun pork (if not bacon) and salmon, possibly on the grounds that they were too fatty. His injunction against sugar is mildly ridiculous considering the amount of fortified alcohol he drank. No wonder he enjoyed the diet so much—it gave him licence to remain in a permanent state of gentle tipsiness. Toward the end of 1864, George Eliot wrote to a friend, ‘I have seen people much changed by the Banting system. Mr A. [Anthony] Trollope is thinner by means of it, and is otherwise the better for the self-denial,’ she adds. The diet also offered the new middle classes a way of navigating new food choices, in much the same way that their embrace of evangelical Christianity assisted them in finding a place for themselves within Britain’s class system. As Joyce L. Huff observes, Banting chose to write his pamphlet as a tract. Similar to other confessions of earnest Christians who had come to the light of God’s grace, Banting’s Letter traces the journey of a humble man—a sinner in a fat body—to the light and clarity of a high protein diet. He had achieved full mastery of both his body and his soul. 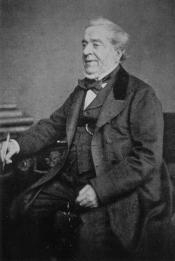 William Banting (from here), presumably after his diet. Firstly, anxieties about diet occur in the midst of major social change. I don’t think that it’s any accident that Noakes has found an audience among South Africa’s middle classes: whose numbers are growing, but who are also feeling the impact of global recession. Diets—particularly strict diets—offer a sense of being in control and of group belonging in times of radical uncertainty. Secondly, as a closer look at Banting’s day-to-day eating demonstrates, his diet and that advocated by Noakes are fairly different. In fact, I wonder if Banting lost weight simply because he was eating less food more generally, than as a result of his switch to greater quantities of protein. Noakes cites Banting and other eighteenth- and nineteenth-century high protein dieters to lend his writing greater validity. This is knowledge, he implies, that has been around for some time. All he’s done is to bring it to wider public knowledge. Yet it’s clear that what we define as high protein has changed over time. Noakes’s diet is a diet of the early twenty-first century. Thirdly, as the short lived initial enthusiasm for Bantingism suggests, this diet is no more successful than other diets at causing weight loss. Put another way, while eating a high protein diet will cause initial, dramatic weight loss—partly through dehydration—those who follow diets which encourage greater exercise and generally lower calorie intake lose the same amount of weight over a longer period of time. This has been demonstrated by study after study. More worryingly, we have no idea what the longterm health implications of high protein diets may be. Connected to this, Noakes argues that it is largely industry—Big Food—which has been behind efforts to discredit high fat diets. Although Banting was ridiculed by some doctors during the 1860s, this was at a time when medical professionals jostled with quacks for recognition, and did not occupy the same position of authority that they have since the mid-twentieth century. Doctors could not band together to suppress this kind of information. Moreover, food companies were in their infancy. Clearly, people chose to relinquish the diet for a range of other reasons. Finally, this—as Banting’s contemporaries pointed out—is a diet for the wealthy, and for a planet with unlimited resources. It is out of reach for the vast majority of people who are obese, most of whom are poor. We know that intensive livestock farming has a devastating impact on the environment. Addressing poverty and rethinking agriculture offer the best means of improving the health of the world’s population and of mitigating climate change. Not eating more animal protein. Joyce L. Huff, ‘A “Horror of Corpulence”: Interrogating Bantingism and Mid-Nineteenth-Century Fat Phobia,’ in Bodies out of Bounds: Fatness and Transgression, eds. Jana Evans Braziel and Kathleen LeBresco (Berkeley: University of California Press, 2001), pp. 39-59. Michelle Mouton, ‘“Doing Banting”: High-Protein Diets in the Victorian Period and Now,’ Studies in Popular Culture, vol. 24, no. 1 (Oct. 2001), pp. 17-32.